Rubio Canyon Falls, Mt. Lowe, Cal. 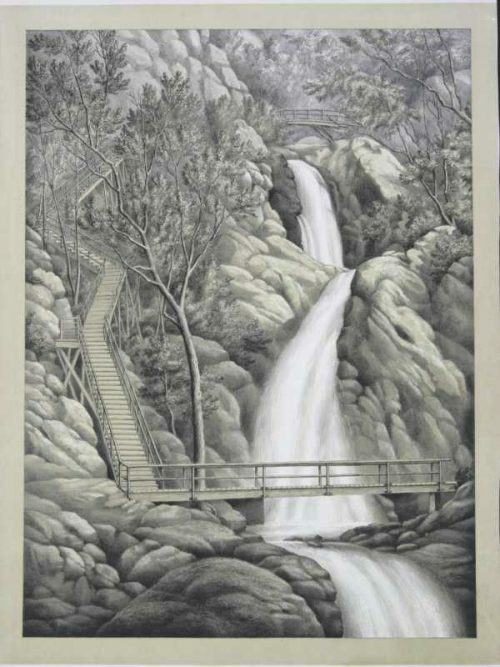 shows a waterfall cascading thru a canyon of boulders and trees paralleling a wooden stairway and bridge. This historic image was published by Louis Kurtz and Alexander Allison who were one of the premier publishers of chromolithographs in the late 19th century. 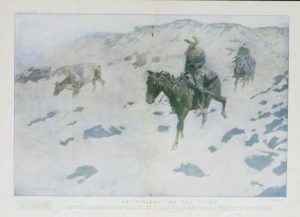 They were mainly known for their large prints depicting the battles of the American Civil War. Similar to Currier & Ives themes they were more interested in appealing to people’s patriotic emotions then historical accuracy. 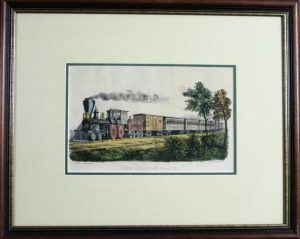 This print is a rare image from this firm. Rubio Canyon is a small canyon that begins on the southern slope of Mount Lowe and runs behind Echo Mountain. 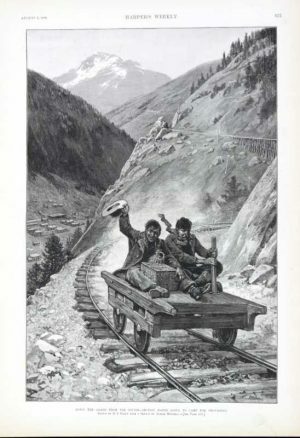 In 1893 the balloonist, inventor and Pasadena entrepreneur Thaddeus Lowe had constructed a railway to the top of Echo mountain and beyond with a pavilion that spanned the canyon. Eventually Mother Nature got the better of the project. As we can see in this magnificent print wooden stairways and staircases were built up and down the canyon to allow visitors to enjoy the beauty of the wilderness. A very historical piece of times gone by. This original chromolithograph is in very good condition.